US Mint sales data this week provides a first glimpse into Lincoln Proof Set numbers. They also show higher demand for UHR coins even before the 25-coin limit increase. And they indicate the briefest of stopping points before 2009 Clad Proof Sets hurdle over the 1 million mark. UHR $20 Double Eagles enjoyed their best week in months. Sales jumped 4,110 — and that, before the 25-coin limit increase was triggered to a start. 2009 Lincoln One Cent Proof Sets debuted on Wednesday, Aug. 26 for $7.95 each. The first four days of sales were strong, but not mind-blowing. Perhaps too many collectors have already gobbled up the clad and silver sets, which also include the special 95 percent copper pennies. Time will tell their direction. Four day sales came in at 66,350. 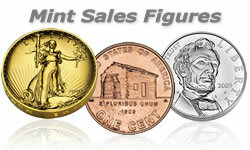 Speaking of proof coins, the clad 2009 Proof Set WILL pass 1 million in next week’s sales report. They are already at 994,095 with their most recent gain of 18,448 added. On the silver side of the equation, at the the current pace it appears it will be another month before 2009 Silver Proof Sets reach 500,000. They are currently at 459,429. Lincoln Professional Life two-roll sets are beginning to move slower. 14,319 were sold versus the prior 24,899. On the same topic, Formative Years rolls were stopped at 300,000 once again. Outside of cancelled orders creating openings, new orders will be held in check. American Eagle Gold and Silver Bullion coins had an exceptional week. Instead of repeating the numbers again, please read the recent CoinNews article Silver Eagles Sales Score Best August Ever, Gold Eagles Fourth. American Eagle Bullion Coin Sales: Aug. & Sept. The US Mint sold 18,764,500 silver and 838,500 gold American Eagle bullion coins in 2009, as of Wednesday, Sept. 2. In less than two weeks, James K. Polk Presidential dollar rolls shot past this year’s William Henry Harrison and John Tyler same roll sales. The US Mint launched the Polk rolls Thursday, Aug. 20. As of Sunday, Aug. 30, collectors purchased a total of 31,915 Philadelphia rolls and 30,920 Denver rolls…. The non bullion coin sales figures above have an "as of date" of Sept 2. The last reported sales figures are located at 2009 Proof Sets Top 975K, UHRs Near 83K.